The Asian Network for Free Elections (ANFREL), the National Citizens’ Movement for Free Elections (NAMFREL) and the National Democratic Institute (NDI) held a Roundtable Discussion on Transparency and Integrity of Elections on November 10 to 11, 2017 at the Novotel Hotel, Quezon City, Philippines. 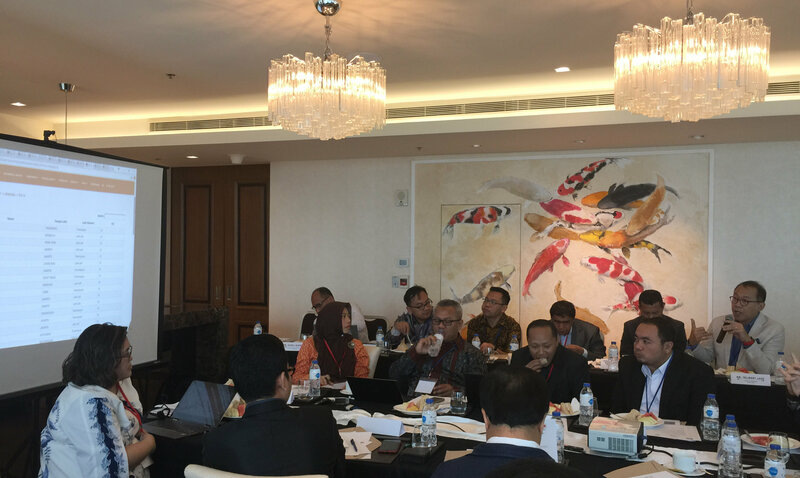 The conference was conducted as a follow-up to the 3rd Asian Electoral Stakeholders Forum (AESF III-Bali) commitments, had participants from ASEAN election monitoring organizations (EMOs), civil society organizations (CSOs) and election management bodies (EMBs) in discussions which delved on the level of transparency and state of integrity of elections in Southeast Asia. Among the topics covered by the forum was the Principles and Practice on Open Data and Electoral Transparency. This session provided an overall context of what open data is and how it can impact transparency of electoral processes, and achieve the aims of the 8 Bali Commitments, namely: (1) Transparent EMBs, (2) Transparent Campaign Fundraising, (3) Campaign Spending, (4) Public Access to Campaign Finance, (5) Transparent voter registration, (6) Transparent observation of national and international elections, (7) Transparent election results and (8) Transparent election complaint process. EMB and election officials shared insights on Policies to Promote Electoral Transparency and Integrity. Discussions focused on the implemented and future policies to promote electoral transparency and their experience in advancing open data and other transparency measures. This was followed by CSOs and EMOs sharing their experience on the challenges and gains in achieving and advancing open data and related Efforts to Promote Electoral Transparency. Open Election Data Assessment Tools and Mapping Exercises was also conducted which identified the most challenging issues each country faces, and how it impacts on the electoral process. These challenges were mapped and synthesized as a guide for a group workshop which encouraged participants to craft ways and share how the assessment tools can be customized to their country contexts. The conference closed with a session on Future Actions and Collaborations to Achieve Transparency and Integrity of Elections at the National and Regional Level. Discussions focused on providing a national and regional plan to achieve transparency and integrity in elections and expectations that existing collaborations will be strengthened among CSOs and EMBs and new ones will be formed. MANILA— A good number of applications for registration particularly from the National Capital Region (NCR) has been recorded during the first week of the ongoing voters registration, the Commission on Elections (Comelec) said Tuesday. Comelec spokesperson James Jimenez reported that an average of 150-200 people have submitted applications for registration in Metro Manila. MANILA — The Commission on Elections (Comelec) will be conducting offsite/satellite registrations in 32 areas in the National Capital Region (NCR) in a bid to reach out to qualified citizens in connection with the ongoing voters registration process for the Barangay and Sangguniang Kabataan Elections (BSKE) next year. Comelec spokesman James Jimenez urged qualified voters in Metro Manila to take advantage of the offsite/satellite registration activities in three districts in Makati City and Quezon City for the whole month of November. The Department of Foreign Affairs, Overseas Voting Secretariat (DFA-OVS), advises the public that overseas Filipino workers (OFWs), as well as immigrants, seafarers and students who are about to leave for abroad, and who are not yet registered as Overseas Voter, may now register to vote, for the 2019 National Elections, at the following Overseas Voter Registration Centers (OVRCs) in Metro Manila until 30 September 2018. Chaired by CIBAC Partylist Rep. Sherwin Tugna, the House panel endorsed approval of House Bill 6604, a consolidated measure seeking to regulate the rates of political propaganda on television,radio and print during an electoral campaign period. The House Committee on Suffrage has moved to strengthen the power of the Commission on Elections to regulate the rates of political propaganda on television, radio and print media to stop certain establishments from milking candidates during political campaign season. It also ruled that the Comelec has authority to require a written permit — even from PSSPs and PSAs members — to bear, carry and transport firearms or dangerous weapons outside of one’s residence or place or work, or in any public place during election period. In a decision written by Justice Alfredo Benjamin Caguioa, the SC upheld the validity of the Comelec regulation that the gun ban covers even members of the private security service providers (PSSPs) and private security agencies (PSAs). The Supreme Court (SC) has affirmed the power of the Commission on Elections (Comelec) to issue rules and regulations to implement gun ban during election period. Citing that there were no substantial arguments to question the order, the Supreme Court (SC) denied with finality the Motion for Reconsideration of former Bantayan Mayor Arthur Despi seeking to reverse the decision of the Commission on Elections (Comelec) on unseating him as mayor. The SC en banc upheld the ruling of the Comelec, where Despi was found to have been disowned by party-list Abag–Promdi (Progressive Movement for the Devolution of Initiative) as their mayoralty bet for Bantayan town during the May 2016 National Elections, which is considered an error in his Certificate of Nomination and Acceptance (Cona), and which the Comelec also used as one of the bases to declare his certificate of candidacy (COC) as null and void. Quisumbing has been receiving reports and complaints that senior citizens and PWDs had difficulty going to the Comelec office because it is on the second floor. Mayor Gabriel Luis Quisumbing said that the new Comelec office will be located on the ground floor of the Mandaue City Sports Complex. THE office of the Commission on Elections (Comelec) in Mandaue City will move to a new office to give better services to the public, especially the senior citizens and persons with disabilities (PWDs). The Supreme Court (SC), sitting as the Presidential Electoral Tribunal (PET), has authorized the hiring of an initial 60 contractual workers for the recount of votes in connection with the poll protest of former Senator Ferdinand “Bongbong” Marcos Jr. against Vice President Leni Robredo. With monthly salaries ranging from P14,586 to P30,000, the contractual employees include a finance consultant, secretaries, ballot box handlers and custodians, copy machine operators, utility workers/messengers, locks custodians, drivers, tabulators, and data encoders. The Ministry of Home Affairs has prepared a security plan that will enable security personnel to reach troubled spots in less than 30 minutes during the parliamentary and provincial polls slated for November 26 and December 7. According to MoHA Spokesperson Narayan Prasad Sharma Duwadi, the government will deploy quick response teams within five kilometres of the polling stations to quickly reach the troubled spots. Malaysia's general election will take place in the next 180 days, Deputy Prime Minister Ahmad Zahid Hamidi said yesterday, and he indicated that it would be held next year. "The elections will take place no later than 180 days from now," he said, meaning it would take place by mid-May. "Those who say that the elections will take place later than that are out of touch with reality," he said at the opening of the annual conference of Parti Gerakan, a component party of the ruling Barisan Nasional (BN) coalition. Governments around the world have dramatically increased their efforts to manipulate information on social media over the past year. The Chinese and Russian regimes pioneered the use of surreptitious methods to distort online discussions and suppress dissent more than a decade ago, but the practice has since gone global. Such state-led interventions present a major threat to the notion of the internet as a liberating technology. Online content manipulation contributed to a seventh consecutive year of overall decline in internet freedom, along with a rise in disruptions to mobile internet service and increases in physical and technical attacks on human rights defenders and independent media. Do social media threaten democracy? The use of social media does not cause division so much as amplify it. The financial crisis of 2007-08 stoked popular anger at a wealthy elite that had left everyone else behind. The culture wars have split voters by identity rather than class. Nor are social media alone in their power to polarise—just look at cable TV and talk radio. But, whereas Fox News is familiar, social-media platforms are new and still poorly understood. And, because of how they work, they wield extraordinary influence. National Citizens' Movement for Free Elections (NAMFREL), Philippines.